Dansko is proud to carry the American Podiatric Medical Association’s prestigious Seal of Acceptance on many of its collections. APMA is the leading association of podiatrists in the United States, and its independently conferred seal confirms that a product is designed to promote the all-around well-being of the foot. Customers who buy a Dansko product with the APMA seal can be confident that they’re purchasing a shoe carefully crafted from the finest materials and with the long-term health and comfort of their feet in mind. Dansko began by selling clogs like the Dansko Professional, but has since expanded to sell sandals, boots, heels, flats, and wedges. All these styles are prized by professionals in a variety of fields who spend long periods of the workday on their feet. They’ve become the number one choice in footwear for doctors, nurses, restaurant workers, teachers, flight attendants, and other workers who want comfort, quality, and style as they go through the workday. 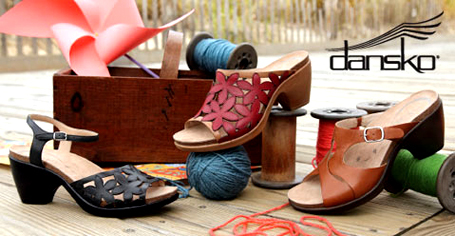 Check out the colors of the spring 2011 Dansko line!